2x7 event tickets are a little different than our other bookmarks/tickets. First and foremost, they can be individually numbered using variable data. Second, designs are printed on a durable 16pt card stock with UV coating. If you need rush, please add rush turnaround ($25) to your order. Unfortunately, we cannot provide these tickets faster than 2 to 4 days plus shipping. Digital proofs in PDF format will be provided to ensure the tickets appear as intended. The template for 2x7 event tickets is different than our bookmarks. One major addition includes the available areas for numbering. In the "Messages / Deadlines" area, you should indicate which area your numbers should be. The default font for the Variable Numbering portion is 14pt Calibri, black ink only. Black ink for the numbering should be taken into consideration when designing your artwork file. If your background images are dark, you may need to KO (knock out) the background image in the numbering areas, so that the numbers are visible. Choose from the 9 numbered areas shown in the example below. You may choose as few or as many areas as you like. Indicate which areas you would like to utilize by naming the Column Headers on your CSV Data File with the corresponding Area Name. Your data file format should be in csv (comma delimited) format only. The below image demonstrates how to set up an excel file. Once you are done, be sure to export (save) the file as a csv file. In order to preserve leading zeroes on your Variable Number CSV file (e.g. 001, 0001) please Format the Cells as Text before creating your numbered list. To include leading zeros: Right-click (or control click) on the first few cells, then Choose Format Cells > Text or Plain Text. Once your cells are formatted, proceed with creating your numbered list. You should be able to see your numbering correctly before saving your document. Note: If you close and reopen your document or look at a preview of the document, it will appear that the CSV has reverted and your leading zeroes were deleted. However, be assured that is not the case. As long as you were able to see the leading zeros at the time you saved the document, your CSV has the leading zeros. 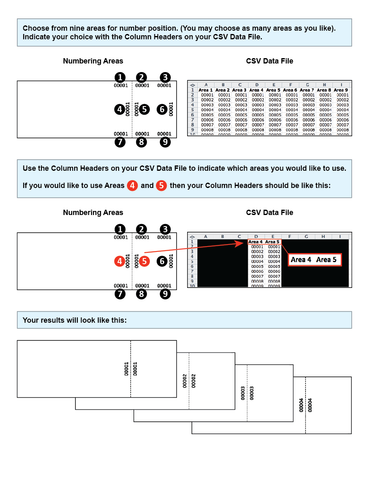 It is safe to upload your CSV and your leading zeroes will be preserved. Perforation is also available. The dotted line on the template files indicated where that perforation takes place.